A simple system for clinicians and administrators to set recall dates for common tests and chronic disease reviews. Alerts for reception staff to remind them what tests are due when a patient books an appointment or speaks to a receptionist. Reminder letters that auto-populate and can be posted or emailed to patients telling them what tests are due. Searches to plan future appointment requirements and identify patients due a recall. The patient recall system is part of our QToolset. This dialog box is launched manually via an F12 prompt. 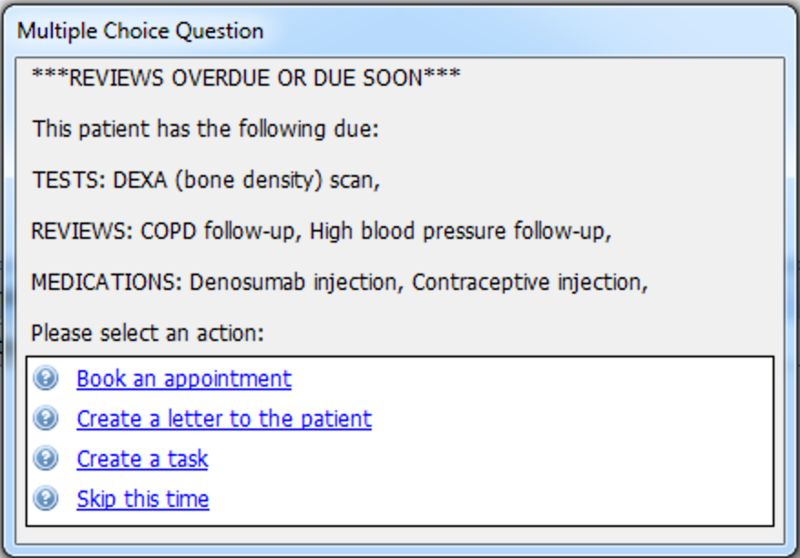 Select the clinical area you want to set a recall for e.g. medication administration (e.g. routine B12 injection), an investigation, or a long-term condition review. The next box offers you more options related to your initial selection e.g. PSA, DEXA, colonoscopy, or chest x-ray. The dates offered depend on what you previously selected and are based around common recall dates for the chosen item. There is no further action that needs taking. The reception recall reminder appears when a receptionist loads a medical record or books an appointment for a patient. This tells them what diary entries are due and offers them choices to action this. Clicking on the "Summary" button in consultation mode shows all recalls that are due. ​Reminders appear in the red "alert"box when a recall is due within the next month or overdue. These can be turned off if you don't wish to see them. Reminder letters can be mail-merged either from our searches or from the reception reminder alert. These can then be printed or e-mailed to the patient.